Calafia Beach Pundit: Why are yields so low if manufacturing is doing so well? Why are yields so low if manufacturing is doing so well? The manufacturing outlook for the U.S. doesn't get much better than it is now. 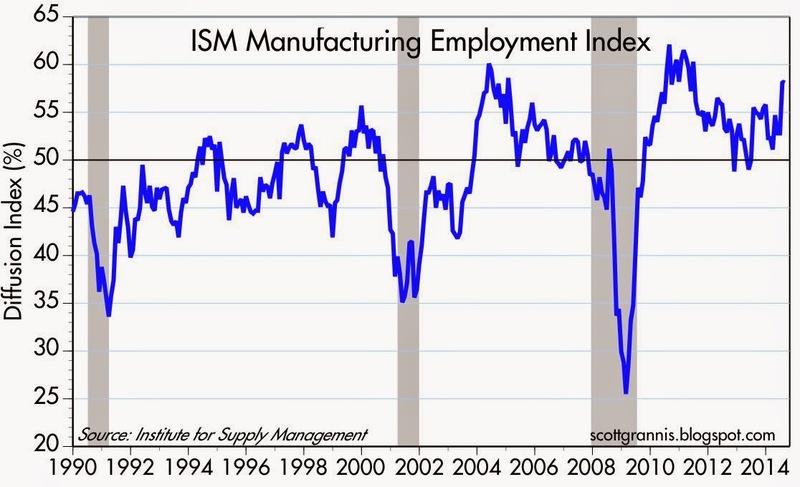 In the past 35 years, the ISM manufacturing index has only exceeded its most recent level (59) about 5% of the time. We're in one of those relatively rare periods when the outlook for manufacturing appears to be robust. So why is the Fed still treating the economy as if it were in intensive care? That's a question that must be disturbing the sleep of at least a few FOMC members these days. 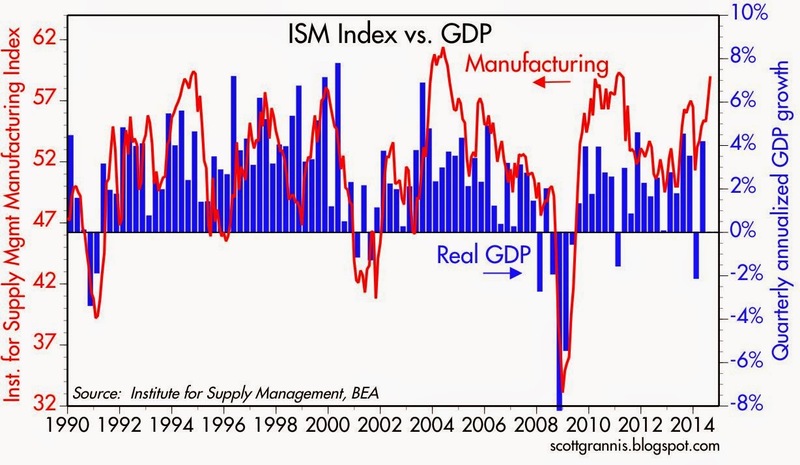 As the graph above shows, the ISM manufacturing index has a strong tendency to track the health of the overall economy. The August reading (which exceeded expectations, 59 vs. 57) suggests it is very likely that GDP growth in the current quarter will be at least 3-4%. That would be a distinct and welcome improvement relative to the average quarterly annualized growth rate of 2.2% that we have seen since the current recovery started just over five years ago. On the margin, economic conditions appear to be improving, and that should be showing up in higher bond yields. Yet Treasury yields remain depressed. That can hardly be the result of the Fed's QE purchases, which because of the "taper" of QE3 that started early this year, are now relatively small and scheduled to go to zero within the next month or two. It's not a lack of growth that is keeping yields low, I think it's a lack of confidence. The employment index of the ISM report was strong too, suggesting that firms are increasingly confident in the future and are planning to staff up accordingly. 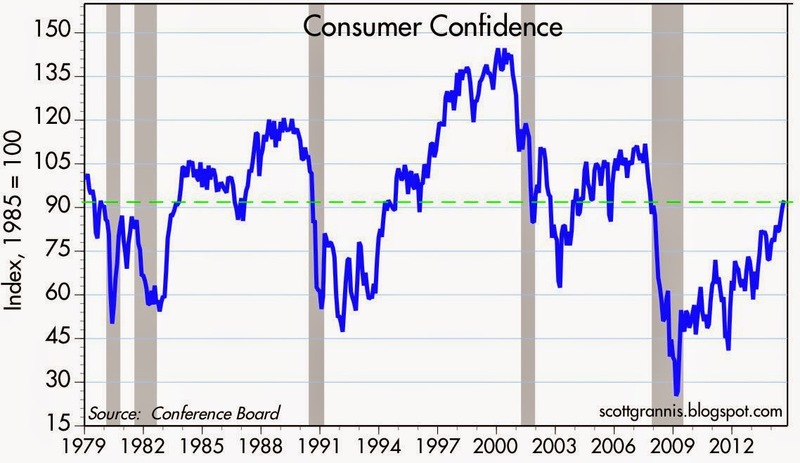 As the second graph above shows, consumer confidence is also on the rise. Things could be and have been a lot better, but on the margin things are getting better, and that is what's most important from the market's perspective. 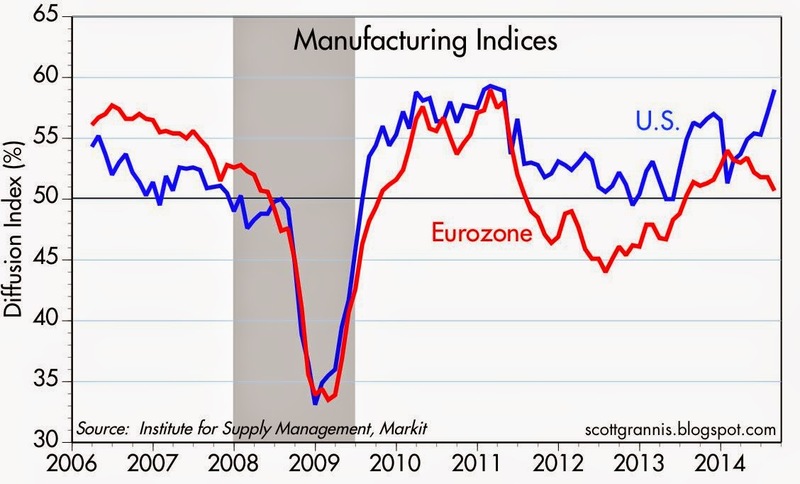 One thing stands out like a sore thumb, however: this year's growing gap between manufacturing conditions in the U.S. and the Eurozone. The Eurozone is really struggling, while the U.S. is doing noticeably better. Eurozone weakness, lingering fears of a Japanese-style stag-deflation, and mounting geopolitical risks in Ukraine and the Middle East are likely all factors keeping U.S. yields depressed. Confidence may be on the rise, but it is still relatively low and there are still plenty of reasons for the market to be nervous about the future. 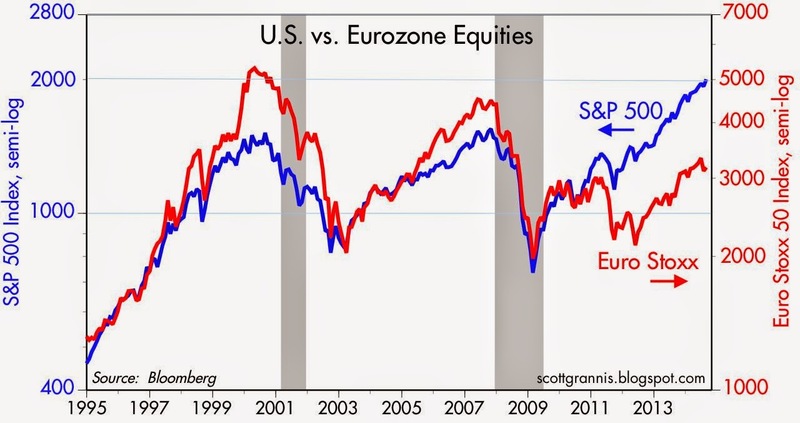 Not surprisingly, there has been a huge relative underperformance of Eurozone equities in recent years. Since August of 2010, the S&P 500 has beaten the Euro Stoxx index by over 60%. Over the same period, the Nikkei 225 has beaten the Euro Stoxx index by over 40%. If the long-struggling Japanese economy is now beating the Eurozone economy, why are 10-yr Japanese bond yields a mere 0.5%? Even though the Nikkei is doing pretty well, it is still quite low from an historical perspective and the yen is weakening (today falling to 105, down from a high two years ago of 78). Although a weaker yen appears to be good for stocks, as I argued last year, it does not inspire a lot of confidence per se. 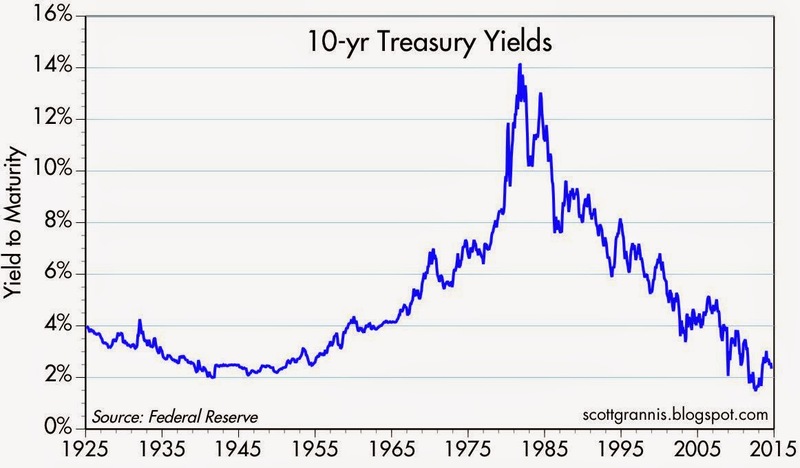 Treasury yields have been falling since 1980, resulting in the greatest bond bull market of the century. Falling inflation was the main driver of falling yields, but that ceased to be the case about five years ago. 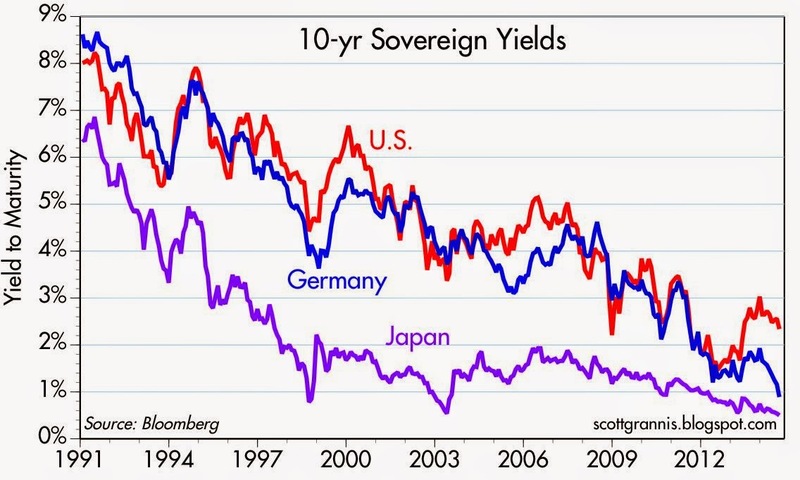 I think the decline in yields in recent years owes more to a flight to quality and safety than it does to deflation. The market is still willing to pay a substantial premium for things, like Treasuries, TIPS, and gold, that offer protection from risk. The above graph suggests that the reason yields are unusually low today is that the bond market and the Fed are very worried about the risk of a slowdown in U.S. economic growth. The market figures that U.S. growth is capped on the upside at 2% a year due to a combination of demographics (the aging of the baby boomers) and weak productivity, which in turn is the predictable result of today's weak business investment climate. U.S. growth could easily be derailed, the thinking goes. 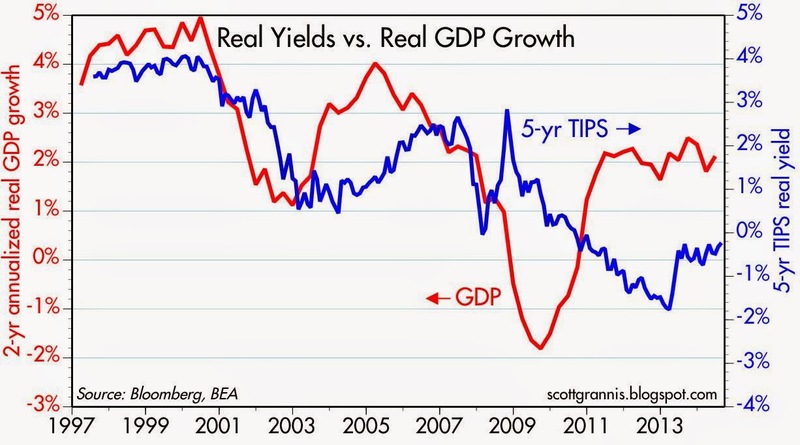 The chart above suggests that 5-yr TIPS are priced to the assumption that U.S. economic growth averages 0-1% over the next few years. The market is willing to pay a significant premium for TIPS in exchange for their inflation hedging properties and their guaranteed, risk-free real yield. 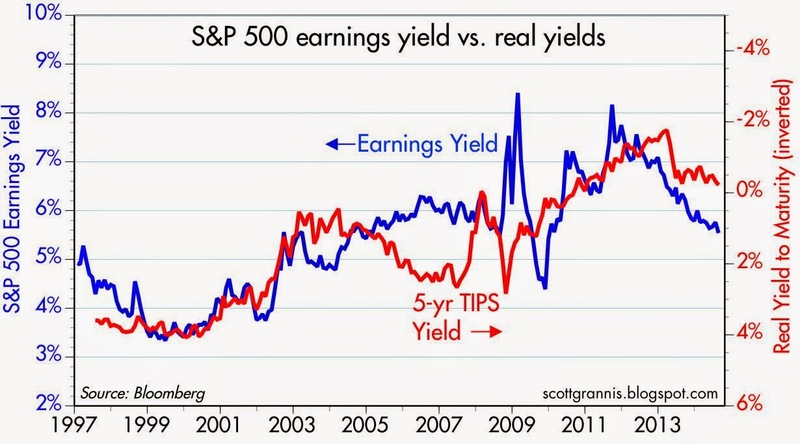 The graph above compares the inverse of 5-yr TIPS real yields to the earnings yield on the S&P 500. The correlation over time looks reasonably good. When real yields were high in the late 1990s, earnings yields on stocks were very low, because the market was very confident that economic growth and profits would remain strong. (That turned out to be wrong, of course.) Today, with real yields in negative territory and earnings yields relatively strong, the market is worrying that economic growth will be weak and profits will fall. No one is willing to pay much of a premium to own stocks these days, whereas they are willing to pay a significant premium to enjoy the safety of TIPS. 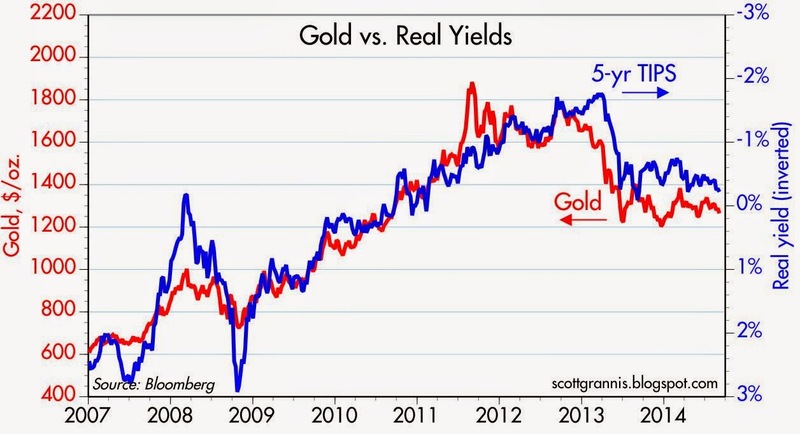 The graph above compares the inverse of the real yield on 5-yr TIPS (a proxy for their price) to the price of gold. TIPS and gold prices have tracked each other amazingly well for the past 7-8 years. Why? Because they are both assets that have intrinsic hedging and risk-reducing properties. Demand for the safety and inflation protection of TIPS has been strong, and demand for the inflation protection and end-of-the-world-as-we-know-it protection of gold has also been strong. Demand for both has weakened in the past 18 months. Why? Because confidence, which was extremely depressed for years following the Great Recession, is slowly reviving. 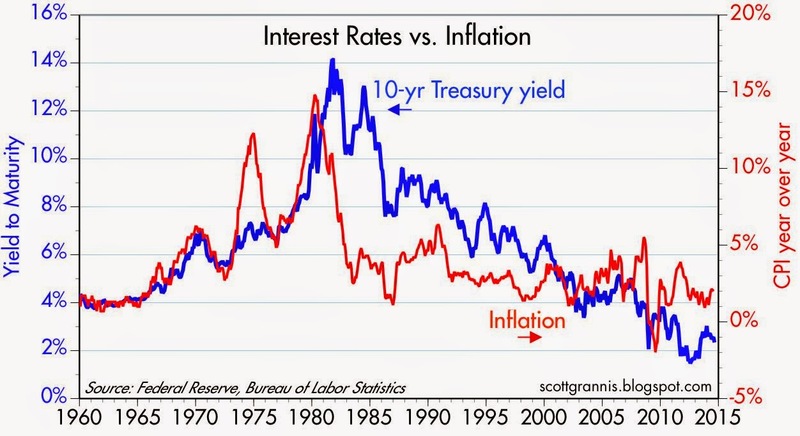 If the nominal and real yields on Treasuries appear to be unusually low, and the prices of TIPS and gold appear to still be unusually high, it is because the world is still willing to pay a premium for safe assets. That willingness appears to be weakening on the margin, however, and more news like today's ISM manufacturing support will likely serve to further boost confidence and weaken the demand for safe assets going forward. This would likely manifest itself in a significant rise in real and nominal Treasury yields, and a decline in the price of gold. Equity investors needn't worry, however, since yields will only move higher as the economic outlook brightens. 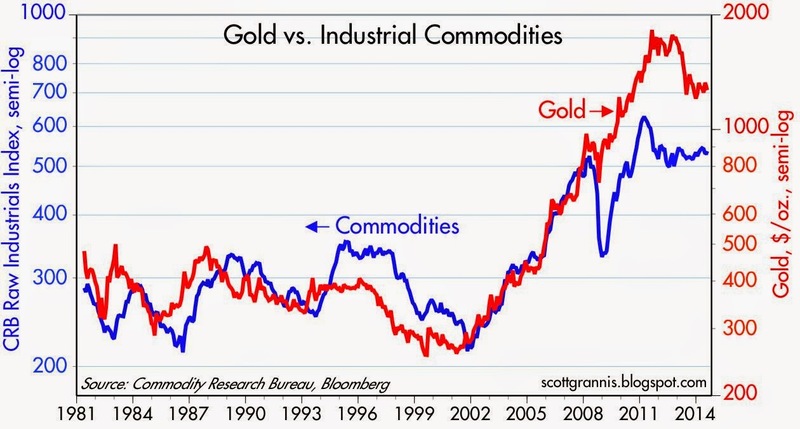 As this last chart shows, gold prices overshot commodity prices beginning in 2009, and appear to have been correcting that overshoot in recent years. In a sense, gold at $1900 was pricing in a colossal inflation mistake on the part of the Fed that has failed to materialize. I won't be surprised if gold declines to $900 or so within a few years. Full disclosure: at the time of this writing I have no position in gold. I think investors are not confident either, in some ways I blame Obama, although Bush jr. in his latter years scared the baloney out of a lot of people too. Why are interest rates so low now? Maybe so. I have previously mentioned a Bain & Co. report "A World Awash in Money." Short story, they say global capital gluts for a long time. And we have global markets for capital. Now PWC comes out and says the amount of investable capital will top $100 trillion by 2020, up from about $60 trillion now. That's trillion, with a "t."
Low interest rates are not going dissuade savings, certainly not in near-deflationary environments. We saw that in Japan. People were packing away savings with interest rates at zero. And are. Corporate America is piling up trillions of dollars (I think this is great, btw, although I wish they would invest more. But profits are good!). Will Corporate America stop earning fat profits if interest rates stay at 1 percent? No, they will pile up more profits. More savings. Professional money managers are talking about a "wall of capital" coming into institutional real estate in the next five years. They wonder if they can invest it all. Savers may want higher interest rates, or Americans might think rates have to "go back up." But interest rates may come down even more. That has been the story in Japan and Europe. Unless we see aggressive and coordinated expansionist central bank action across three continents, I suspect this is the "new normal." Very slow growth, very low inflation, very low interest rates, and plenty of capital. I too wish for "structural reforms." Lower taxes, less regulations. It won't happen in a democracy. Who is going to cut VA benefits? How about sugar tariffs? Less aircraft carriers? Kill the food stamp program? Eliminate the USDA? Cut the home mortgage interest tax deduction? Wipe out the Commerce Department? HUD? Eliminate real estate zoning restrictions in Orange County? High-rise condos along the shore in Newport Beach? Put an international airport in the park? An airport surrounded by industrial warehouses? Instead you got hot air balloons. Woo-woo. Scott, I thought your argument about low bond yields being caused by risk aversion by American investors made a lot of sense until late 2013 - 2014. Over the past year I think there must be more to it which required looking beyond the USA. I should think that much of the reason is foreign investment in US bonds because of 1) reaching for yield by Japanese and other investors who find U S rate appealing relative to their homelands' and 2) flight money from countries involved in civil wars and from their neighboring countries. There are quite a few such countries stretching from Libya to Pakistan and Afganistan. And more recently, the Ukraine and concerned neighboring states bordering the former USSR including Poland and the small Baltic states. Argentina represents another type of flight money due to a falling currency and high and rising inflation. Russia itself could be a source of flight money to western bonds for similar reasons. Then there is much of Africa. And now there is political instability and demonstrations in Hong Kong. I agree that "fear" is the basis for the demand for sovereign debt; but I suggest that it is most likely arising external to the USA since consumer confidence just hit a post recession high here. And, personally, I don't hear any fear talk as one did in 2009 - 2011. William: I think my comments in this post are compatible with your theory. It was not my intention to rule out foreign investors' demand for safe U.S. assets as a factor behind unusually high prices.